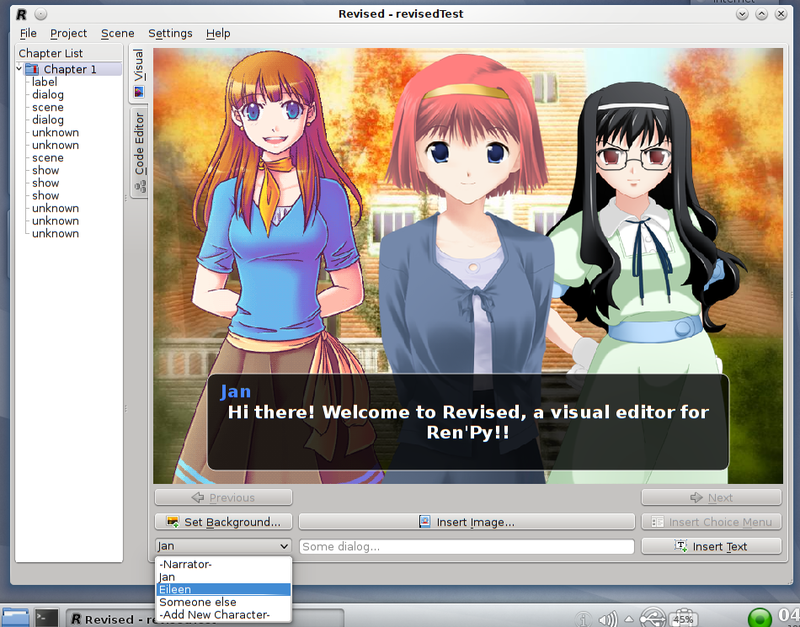 Revised is (or rather, will be) a simple visual editor (or wizard/assistant/GUI) for Ren’Py, the visual-novel game editor. It is in the early stages of development. At this point, you can create new projects, load them, add backgrounds to the scenes, insert other images (sprites), add dialog, define characters, and define images. You can’t yet add selection menus, jumps or labels, or remove chapters and their steps. Version 0.1 is out, as a preview, via Qt-Apps.org. Next steps will probably be adding the capability of removing chapters and steps, of adding choice menus with jumps, and setting labels for those jumps. With that, a basic game could be created. 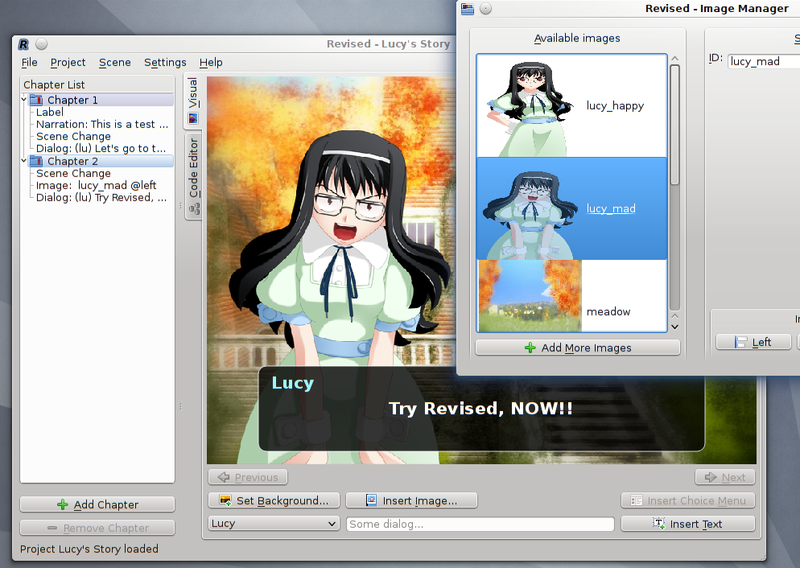 Revised is free (as in freedom) software under GNU GPL license, based on Qt, and mainly targeted at GNU/linux systems. This is Lucy, and she’s mad! This is great stuff. Do you have any current plans for this? I saw the last commit was in April. I’m glad you like it! I plan to keep working on it, but at the moment I’m more motivated to work on Dianara, my pump.io app, so it might be a while until Revised has new features. Thank for you effort. I had some look for creating renpy visual constructor by qt, but I am glad to see you make my (“somewhere”) plans to reality. Such simply useful free tools need to saving world cultural diversity, especially for small nations. Nice work. Thanks 4 this work. Well, you can test v0.1 or the development branch from Gitorious, if you wish. I should note that Revised development is in hiatus ATM. I hope to get back to it ‘soonish’. This project has really fascinated me. I am the co-founder of an educational NGO and this GUI is great. I am ready to pay 300 USD for developing this project. Creator has stated they abandoned this after 3+ years of neglection and has moved on to other projects. Blog is listed on the main page sadly. Hopefully this will be releases as Open source and allow other communities to take part in i.
I’ve never said I’ve abandoned this, I’ve only said it was on hiatus. As for the second part, this program has _always_ been Free Software, from day one, so people can contribute to it, or fork it if they see fit.